mean all the time. : Chapatis. My husband and I used to always joke around about one of the ways a bride used to be selected in India. The prospective husband's parents actually come over and monitor the way the prospective bride would make her chapatis; a perfect chapati has to be round and soft. 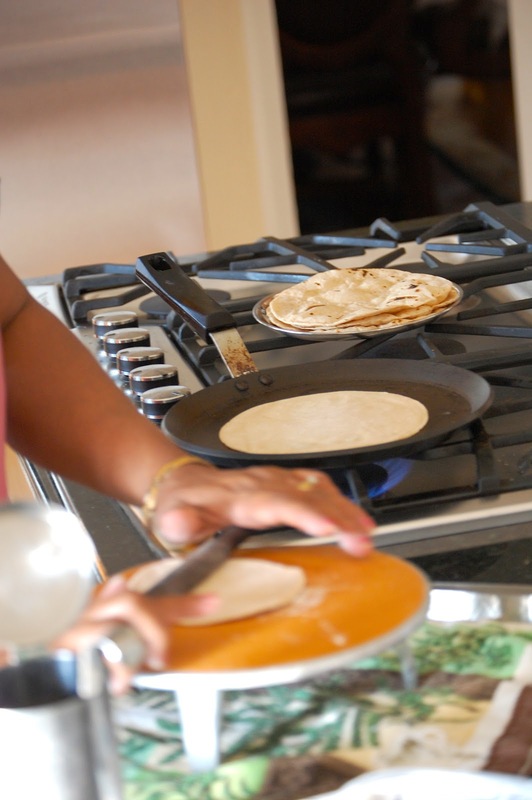 Of course, she has to be able to roll one chapati, while tending to another on the stove. If they were happy with the results, then she was a suitable wife for their son. Thank goodness I wasn't subjected to that elimination process when I was getting married. I often compare chapatis to flour tortillas when I try to explain them. They are not as familiar at the Indian restaurants as naan is, but they basically serve the same purpose. They take the place of rice with any Indian curry or side of vegetable. It is made with wheat flour and is a healthier option to basmati or jasmine rice. In Gujarat, where my mom is from, they eat chapatis with every meal. My dad is a rice and curry kind of guy, so our family grew up with rice for every meal, and chapatis on the side, if need be. As a kid, I used to enjoy hot chapatis with jam, or mangoes. As a special treat, during mango season one of our meals would be "ras rotli". Rotli is the Gujarati word for chapati, and Ras is the juice of a mango. So, yes, our lunch or dinner one lucky day would be the juice of a box of mangoes with chapatis. Next time you're feeling adventurous and decide to cook your own Indian food instead of opting for take out, try your hand at some chapatis. They take a little bit of practice to get them just right, but don't be discouraged, it'll get there! 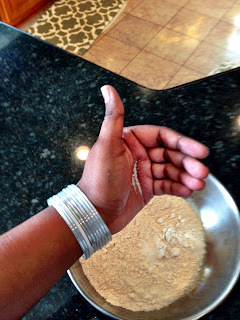 Here's a recipe that gets me soft chapatis and hopefully will help you get it perfect every time. I have to apologize in advance, I've realized that I am not a good teacher. I will do my best though so you too can make some perfect chapatis. Tongs so you don't burn your little fingers. Knead the dough for a few minutes. Kneading the dough is very important, make sure you don't skip this step. Now, grab your rolling pin. This is the only rolling pin that I own. It's not your typical bakers rolling pin, but it does the trick. I don't know what the real name for it is, but I aptly call it a chapati rolling stick. I use it for chapatis, cookies and everything in between. Evenly divide your dough so you have around 10-12 smaller balls. The amount of balls depends on the size of chapatis that you want. I went for balls the size of a lime...ish. I flattened the ball with my palm, and then if you notice in the picture below I dunked it in the little container of flour. A good way to avoid this is to flour the surface you're rolling the chapati on, as well as the dunking in flour method I mentioned. Now, take your rolling pin and starting from the center of the dough, roll out. When you're just starting, don't rush it. Take your time and make a chapati. After every roll, to keep your round shape, turn your dough a quarter turn. Roll, turn, Roll turn. This avoids the sticking to the counter and helps maintain a round chapati. This is where my chapati making for the day came to an end. You see that picture above? Well, I purposefully made my chapati stick to the counter this time to illustrate why dunking it in flour was important (I have a feeling you don't believe I did it on purpose). But of course this was the moment my mom walked in the door and saw the mess on the counter and jumped to the conclusion that I did not know what I was doing. But really, what explanation could I give her? "No really mom, I did this on purpose for my blogging community." I can hear her response already "Blogging? What is this blogging business?" It just seemed easier for her to take over. Since I wanted to take photos of the process anyway, it would be easier if she was making it. Which didn't help my case any. "Oh you want to take photos so you can remember what I'm doing next time so you won't mess up again?" Ugh. She pulled out a little stand that she makes her chapatis on, so she doesn't get flour and dough all over the kitchen counter. I immediately explained to her that I hate using the stand because it always slides when I'm rolling the chapati. To which she took out a kitchen towel and placed it underneath the stand. Smart lady. Though I'm standing in her kitchen at the old age of 33, she still has a way of making me feel 13. The chapati was thin enough to cook the dough all the way, yet thick enough to pick up without getting holes in the dough. Warm up the frying pan on the stove and place the chapati on it. Once it starts to bubble a little, flip it over. And the other side should start to bubble a little. When this happens, remove the frying pan completely, and put the chapati on the burner. It'll start to fluff up. That's a beautiful looking chapati. Note: your first attempt WILL NOT look this round, or get this fluffy. Make it often and it will get there. You can still see the steam coming up from this one. This is the point where my mom or grandma would spread some jelly on it and hand it to me to snack on. Indians also put ghee on the chapati at this time, or butter, but that's just added calories. Try it once though, it's pretty tasty. But then don't do it again, because as we know, if it's tasty, it's not that good for you. For the record, this is one that I rolled out. No, it isn't as perfect as my mothers, however, it'll do. There you have it. Chapatis are a healthier alternative to rice and allow the flavor of the curry to come through much more than rice does. Try it. Bananas and Almonds. Try it.